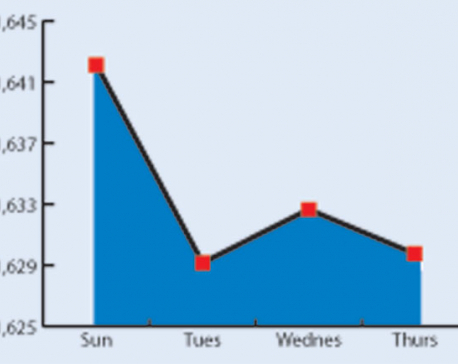 KATHMANDU, Feb 10: Nepal Stock Exchange (Nepse) benchmark index fell 19.48 points this week to close at 1,391.03 points on Thursday -- the last trading day of the week. The stocks have again gone into correction course after recovering some of the lost value in the last two weeks. As the ultra-high level of interest rates show no signs of going down, stock investors are feeling the pinch. Many investors who have borrowed from banks to buy stocks are selling their holding to repay their loans, others see high deposit rates more beneficial to invest than in stocks when they are on a downward trend. Brokers say that there is intense selling pressure in the market as the interest rates are going up instead of correction. BFIs are raising their interest rates on deposits as they are struggling to arrange lendable funds due to slowdown in deposit growth and rise on lending. All trading groups ended in the red zone this week. Insurance group become the biggest loser as its sub-index dived 125.1 points to close at 7,066.46 points. Hydropower group followed the suit. Its sub-index slumped 37.36 points to close at 1,780.32 points. Microfinance group shed 33.39 points and ended at 1.661.72 points. Sub-indices of Hotels and Development Bank groups also went down 19.57 points and 16.42 points, respectively, settling at 2,083.85 points and 1,572.31 points. Banking, the heavyweight group, fell 17.07 points and finished at 1,212.0 points. Manufacturing and processing group also registered a loss of 17.46 points to end at 2,450.48 points. 'Others' group ended 4.82 points lower at 761.65 points. Sub-indices of Trading and Finance groups also fell 2.79 points and 2.97 points, respectively, closing at 211.99 points and 707.78 points. 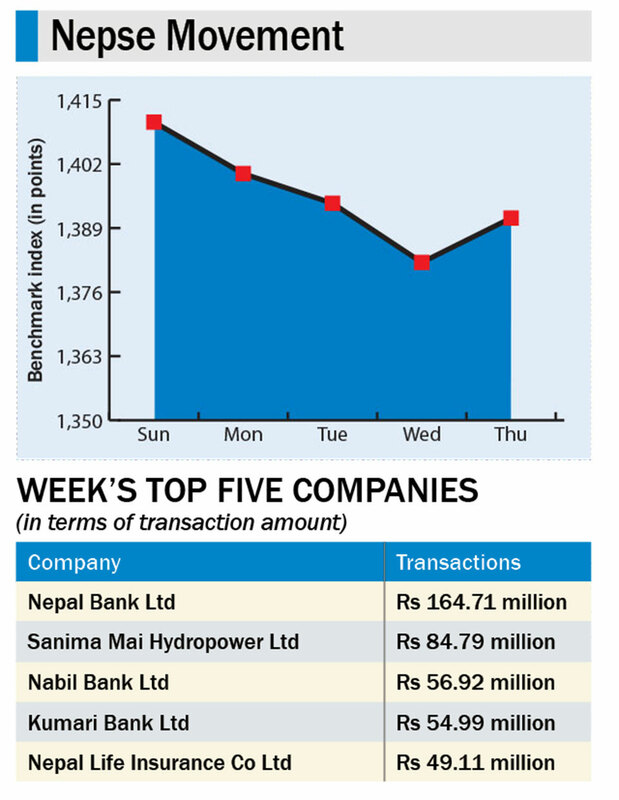 Nepal Bank Ltd topped the list of companies in terms of highest turnover (Rs 164.7 million) and number of traded shares (461,000) while Kumari Bank Ltd remained at the top in terms of number of transactions (402). 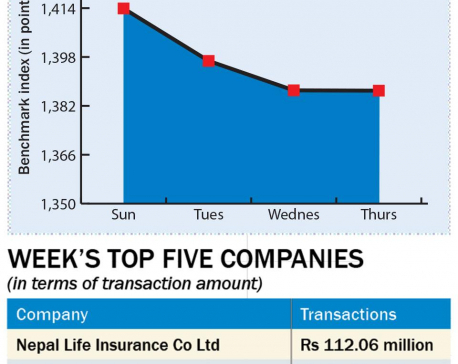 A total of 4.2 million units of shares of 172 companies worth Rs 1.55 billion were traded in the market this week through 16,769 transactions. The turnover was 13.31 points lower than the last week. 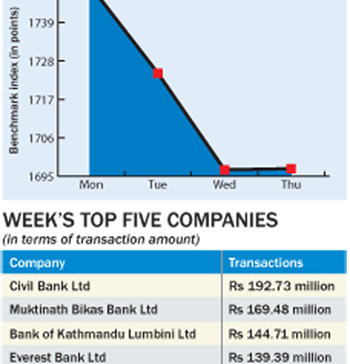 Shares of Bank of Kathmandu floated through follow-on public offering (FPO) as well as bonus shares of Chhimek Laghubitta Bittiya Sanstha Ltd, Soaltee Hotel Ltd, ICFC Finance Ltd, and Swadeshi Laghubitta Bittiya Sanstha Ltd were listed in Nepse this week for the trading. Rights shares of RSDC Laghubitta Bittiya Sanstha Ltd were also listed in Nepse this week.